Asher Mullard has written for Nature and The Lancet. Sierra McLane stretched a rubber swim cap over her head, snapped her goggles into place, and swung her leg up and over the lowest branch of a gnarly whitebark pine tree. Her Ph.D. advisor, Sally Aitken, had sent the University of British Columbia student to Whistler to collect hundreds of pine cones in summer 2007, and the gear was her protection against sap. The whitebark is one of seven endangered tree species in Canada. More than 100 years ago, invasive fungi first started wiping out the conifers. Along with hungry mountain pine beetles, the fungi have pushed the tree to the brink. Global warming has provided its own pressures. A gloomy study by the United States Forest Service predicts that 97 percent of the pine’s native slopes will be too hot for the species past 2100, leaving little hope for the slow-growing tree, which can take up to eighty years to produce large crops of cones. 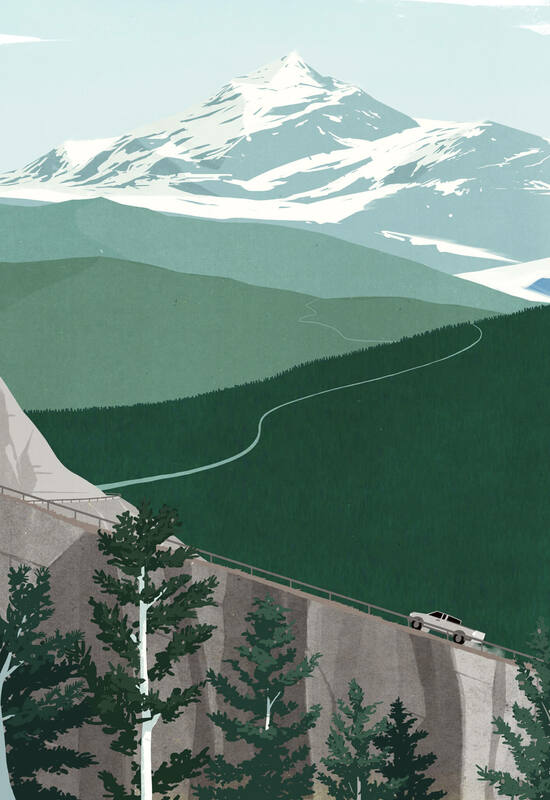 That hot August day, McLane was gathering cones for an audacious plan: to see if the trees could survive as far as 800 kilometres north of their current range. McLane and Aitken, the latter a forest geneticist at UBC, used climate models produced by their colleagues and scoured maps of BC’s projected future conditions to identify nine sites where the pines might thrive in a warming world. A few months later, after preparing the seeds to germinate from these cones in a lab, McLane and two assistants would drive the Toyota Tacoma pickup truck they nicknamed Bean more than 3,000 kilometres from Vancouver to the Alaskan border, dodging grizzly bears to plant 18,000 whitebarks on remote mountains—a testing ground for imagining forests of the future. Other trees, including subalpine larches in western Canada and ashes in Ontario, are facing similarly dire outlooks. North America’s old-growth forests are dying at an alarming pace. Mortality rates are doubling approximately every two decades. While bugs, birds, and beasts race poleward to track their preferred climate zones, trees can’t move fast enough to outrun their enemies: longer drought seasons, hotter heat waves, freak cold spells, insects, and diseases. It’s not just our trees we stand to lose. Each year, Canadians harvest 150 million cubic metres of lumber—enough telephone poles to stretch from the earth to the moon nearly five times over. In 2013, forestry contributed $19.8 billion to the country’s economy. More than 321,000 Canadians work as loggers, millers, paper makers, planters, road builders, helicopter pilots, or truck drivers in the forests. One 2011 study, by the National Round Table on the Environment and the Economy, predicts that lost timber production from climate change could wipe between $25 billion and $176 billion from our collective bank accounts over the next seventy years. For Aitken and a handful of other BC-based researchers, one answer is assisted migration. A re-engineering of sorts, the process involves manually planting trees farther north than their seeds would naturally fall in order to extend their ranges and, hopefully, their lifespans. Experimenting with the architecture of, say, the BC clear-cuts managed by commercial foresters only makes sense. Planters already push more than 200 million saplings per year into the soil on those plots. “If we’re sticking trees in the ground anyway, we might as well change the direction,” Aitken said. Seven years after the planting experiment, I visited Aitken’s office in Vancouver. 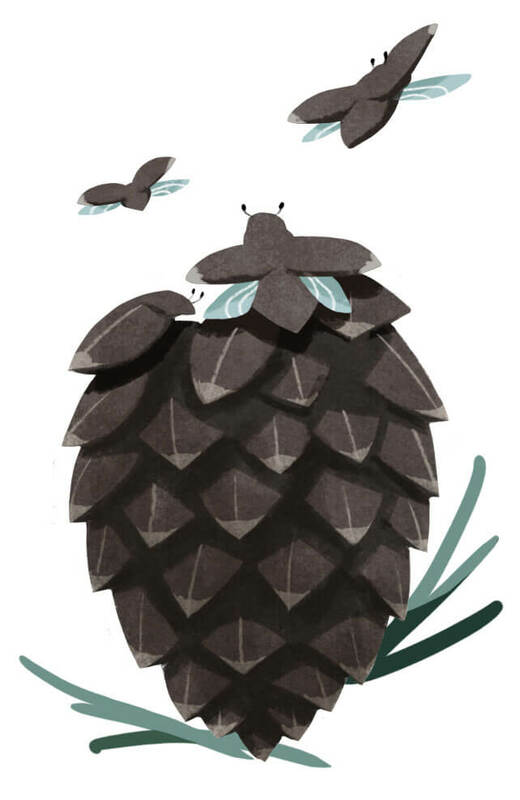 Cones were strewn across her desk, the largest a foot-long beauty from the Coulter pine. (I picked it up; it was surprisingly heavy.) Botanical prints hung from the walls, and an oversized metal acorn sat on a bookshelf. Aitken, wearing silver gingko leaf earrings and a tree pendant, showed me a photograph of the transplants taken last summer. In the picture, a bushy, five-inch-tall seedling poked out from the snow. It looked newly sprouted, despite being seven years old. “This is whitebark pine leaping out of the ground,” Aitken said, excitedly. It’s a promising start but, because of the glacial rate at which trees grow, the research won’t yield definitive results for at least another twelve years. Aitken will have to hand her project off to a younger researcher one day, something of a tradition in the slow-moving field of tree science. “Sierra said she’d push me up there in a wheelchair to see the results if she had to,” Aitken said with a smile. But this timeline poses another, greater problem for assisted migration advocates. Nobody knows exactly what future climates will look like, which makes calculating where trees will prosper a huge challenge. Temperatures could rise anywhere from one to four degrees by the end of the century in BC, and precipitation could increase by anywhere from 10 to 20 percent in the same time span. Even if researchers could plant seedlings perfectly adapted to the higher temperatures of 2050, the newborns might freeze to death when ravaged by next year’s winter winds. Assisted migrants must be able to handle the winter lows they’ll experience as youngsters just as well as the summer highs they’ll experience in middle age, forcing researchers to think a little like fortune tellers. “Our crystal ball is pretty crappy,” Aitken said. To design the perfect forest for such an uncertain future, foresters will likely test out a range of different transplants and let evolution take its course. “I want to show you one of those big pumpkins,” said Barry Jaquish, a tree breeder with BC’s Ministry of Forests, Lands, and Natural Resource Operations, pointing up the hill to some tall conifers. He’s talking about a forty-metre-tall Douglas fir, artfully named R1 PR160 T11, per an aluminum dog tag tied to its trunk. We’re walking through the Trinity Research Forest, just outside the dry Okanagan Valley in the southern Interior. It stopped raining just before we arrived, but in minutes my hiking shoes are soaked through by the wet underbrush around us. The air hangs thick with the citrusy smell of evergreens as we clamber through the brush, arriving at the base of the enormous fir. “This is a perfect tree,” Jaquish said, pointing out its flawless taper and perpendicular branches. R1 PR160 T11 is an assisted migrant, planted years before the term gained scientific currency. In 1975, Keith Illingworth, a forward-thinking forest geneticist working for the BC government, gathered Douglas fir seedlings from sixty-four different sites as far afield as central Mexico* and planted them all in orderly squares here on the outskirts of the Okanagan. In one patch, local Douglas firs from Revelstoke stand straight and tall, orange needles lying at their feet. Next to them, ferns fill the forest floor where the skeletons of maladapted Mexican migrants have long since rotted away. Some of the biggest specimens from the lot, R1 PR160 T11 and its siblings hail from Skykomish Pass, in Washington State, more than 500 kilometres south of where our feet are squelching in the mud. This arboreal patchwork shows that geographically separate Douglas firs are vastly different from one another. Assisted-migration advocates want to tap into this genetic diversity with an eye to future climate predictions, and match trees with the right traits in new locations. That means reverse-engineering evolution. If they can figure out how to predict that a tree like R1 PR160 T11 would prosper in the Trinity soils, for example, they may be able to replicate the towering giant’s success whole forests over. But if the Skykomish expats show the potential for getting it right, Monte Lake transplants show the perils of getting it utterly wrong. Monte Lake is only 100 kilometres away from where we stand, but its microclimate is much drier. On a small square of land in Trinity forest, twenty-five sickly trees stand barren, blighted, and brown, overhydrated and crippled by a foliage-destroying fungus. Small climatic changes make a huge difference here, and the stakes for planters are high. If scientists don’t match seedlings and climatic conditions with precision, we could wind up with swaths of land covered in rotting Monte Lake look-alikes. Back down the road, in Vernon, Greg O’Neill, a provincial research scientist, is trying to ensure the foresters toying with nature get the mix just right. Seven years ago, he planted fifteen species from forty-eight different locations at the Kalamalka Research Station. From the neighbouring Highway 97, O’Neill can see only a few scraggly lodgepole pine, cedar, and spruce saplings poking up over the weeds. “Most foresters would laugh if they saw these,” said O’Neill. But the research station is in a desert grassland, and O’Neill was curious to see what would happen to the saplings when their water supply was limited. He has also replicated this planting pattern forty-seven times between Yukon and California to see how the trees fare under a range of climate conditions. Like the whitebark experiment, this study will take at least a decade to yield useful insights. Aitken thinks genomics approaches can provide much faster readouts. In fridge-sized growth chambers back in her labs at UBC, students are growing seedlings under tightly controlled climates that mimic locations around the province. When the trees are two years old, they’re subjected to extreme heat waves, sudden freezes, and all kinds of other assaults that test their climatic tolerance. “We are measuring them to death,” Aitken said. Preliminary data suggests, for example, that forests designed to withstand the coldest winter colds may do better than those built to survive the driest summer droughts. Because Aitken’s team has also analyzed the genetics of several thousand seedlings, they will be able to match trees to their optimal regions and, ideally, future-proof our forests. Assisted migration isn’t popular. For decades, conservationists have gone to great lengths to root out invasive foreign species wreaking havoc on local ecosystems. Foresters, too, recognize that local trees typically make for healthier—and, therefore, more profitable—forests. In part, this is because the risks of unintended consequences are high when you shuffle trees across the landscape. We’ve messed up before: The fire tree, for example, is an evergreen from the Azores and the Canary Islands that Portuguese colonists brought to Hawaii in the late nineteenth century. It draws nitrogen from the air and spreads it through the soil, laying down a supply of fertilizer. As the immigrant species spread, other foreign nitrogen-needy plants suddenly found themselves able to flourish in Hawaii. It completely changed the islands’ ecosystems. Aitken’s research, however, suggests that we can reap considerable benefits by moving trees slightly northward to where they’re still within their natural ranges. “There is a principle here: the farther you move something, the more unpredictable the ecological effects are,” she said. That idea still scares some conservationists. Daniel Simberloff, an invasive species expert at the University of Tennessee, Knoxville, noted that each new migration project legitimizes riskier efforts. He offered the example of the Torreya Guardians, a group of citizen naturalists determined to rescue the endangered Torreya pine. The well-intentioned group has planted seeds from the Floridian conifer as far as 600 kilometres from home. “They’ve just decided on their own to move trees with no consideration, no oversight, by anyone with expertise in tree biology,” Simberloff said. “That is a terrible precedent to set.” If we were to use the same approach with endangered animals, he said, we’d see transplanted mammals, fish, and birds damaging ecosystems and pushing native species to extinction. That’s what Greg O’Neill is working toward as he builds a regulatory framework that would engender diversity in BC’s timber forests. The provincial government has strict rules in place that compel foresters to use seeds from local trees when replanting their clear-cuts. O’Neill argues that new guidelines will provide the flexibility to plant seeds based on the most up-to-date climate projections, while mitigating the risks of excessive movement. He submitted a set of recommendations in April, ahead of planned implementation in 2017. Yet questions persist as to how this will work in practice. Foresters could choose to move trees around to maximize short-term timber volumes instead of prioritizing resilient, diverse growth. And the industry-friendly BC government has been slashing regulatory oversight. Between 2000 and 2010, the province laid off a quarter of its forest service workers. In 2010, each staff member was responsible for eighty-seven times more land than his or her US counterpart. Already, there are signs that an understaffed and underfunded department will be unable to uphold a dense, science-based policy. Five years ago, a pathologist with the BC forests ministry reported that one-third of the Okanagan plantations that had reached “free-growing” status—meaning their trees were thriving again—had deteriorated. When revisited years later, they no longer met the requirements. A more global problem also looms: assisted migration is designed to treat the symptoms of climate change, but not the disease. “Some view it as a techno-fix for a problem that we are not dealing with,” Aitken said. But we are past the point where we can mitigate the damage simply by burning less fossil fuel, she added. And despite the risks that do exist with assisted migration, the risks of inaction are massive. Back in fall 2007, near the end of McLane’s whitebark planting trip in BC, it started to snow. Parked in whiteout conditions on a mountaintop, with no views to admire, McLane pulled a fourth layer over her down coat, grabbed her fingerless gloves, and braced herself for the whipping wind. Each day, as the temperature dropped, her unplanted seedlings became less likely to make it through the winter, leaving them in as much danger as ever and us no wiser for it. Crawling through ankle-deep snow, McLane spent her days scraping out holes with a tent peg and pushing the sprouts into the frozen dirt with her bare, numb fingers. Then, as now, the experiments had to go on. “We’re in a race against time,” she said. * The printed version of this article incorrectly extended the natural range of the Douglas fir into Saskatchewan.